If there’s one musical theatre composer who’s able to subvert expectations, it’s Sondheim – the man who can tell a story backwards, explore relationships with brutal honesty, reveal the darker side of childhood fairytales and find humour in a pair of serial killers. Assassins, then, is no different. Who else could eke out sympathy from America’s most notorious killers? 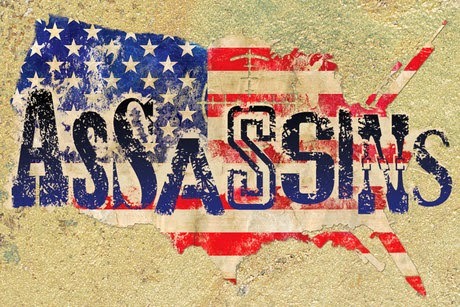 The likes of John Wilkes Booth, Charles Guiteau, John Hinckley and Lee Harvey Oswald are brought together like some grim murderous family, the show detailing the hits and misses of various assassination attempts on US Presidents. It’s a satire of the American Dream that gives voice to the unheard, to those whom America has failed and de-humanised. In Sondheim’s words, “everybody’s got the right”. Through its mockery of traditional American band music (and one of Sondheim’s most tuneful scores), we find truth, honesty and injustice in a series of psychotic, maniacal characters. Watching Harry Morrison’s madly devoted Hinckley (obsessed with actress Jodie Foster) and Carly Bawden’s Lynette Fromme (lover to Charles Manson) singing the beautiful “Unworthy Of Your Love” to their respective loves prior to committing murder is as unhinged as Sweeney singing to his razors. There are more time travel anomalies than a Christopher Nolan film, but the various disparate parts are held together by a circus theme (“you wanna shoot a President?”) as well as the fictional Proprietor (a muscly Simon Lipkin with clown paint dripping down his face and a target on his back), a banjo playing hill-billy Balladeer (Jamie Parker), and a small ensemble of bystanders representing the general public. It’s madness, but it works. Soutra Gilmour’s set for this production continues the deranged and grimy circus theme: monologues are delivered from a dodgem car; the cast crawl over a huge clown head forlornly left on its side; and overbearing hit and miss signs light up after each gunshot. The use of blood red confetti also provides some powerful imagery. It’s true that, whilst the performances are all wonderfully twisted, some characters are given more stage time than others. John Wilkes Booth is meant to be the leader of the group, but the pretty-voiced Aaron Tveit doesn’t quite have the stage presence – particularly by comparison to Lipkin’s burly Proprietor who is the real controller of the drama. Andy Nyman is a playful yet uncontrollable Guiteau (who looks more than a little like Sondheim himself); David Roberts plays a touching, quietly mournful Czolgosz with a resonant bass voice; Stewart Clarke’s Giuseppe Zangara is suitably psychotic in his early number (but is overall underused); and the pairing of comedian Catherine Tate and Bawden as Sarah Jane Moore and Lynette Fromme is full of laugh-out loud black comedy. Mike McShane also brings humour into his lengthy monologues as the Santa imitating Samuel Byck, in which Sondheim pokes fun at his old collaborator Leonard Bernstein. The ensemble, however, are largely unnecessary – there simply isn’t enough for them to do, detracting from what is otherwise a taut character drama. Their penultimate number “Something Just Broke” saps all the tension out of a glorious climax. If Byck’s story of hijacking a plane tells us anything, though, it’s how much Sondheim’s musical still resonates with a modern audience (its premiere was in 1990). There’s plenty of humour in this dark satire, yet for all its psychotic performances and cleverly fantastical directorial touches from Jamie Lloyd, there is a frightening realism bristling beneath the surface. 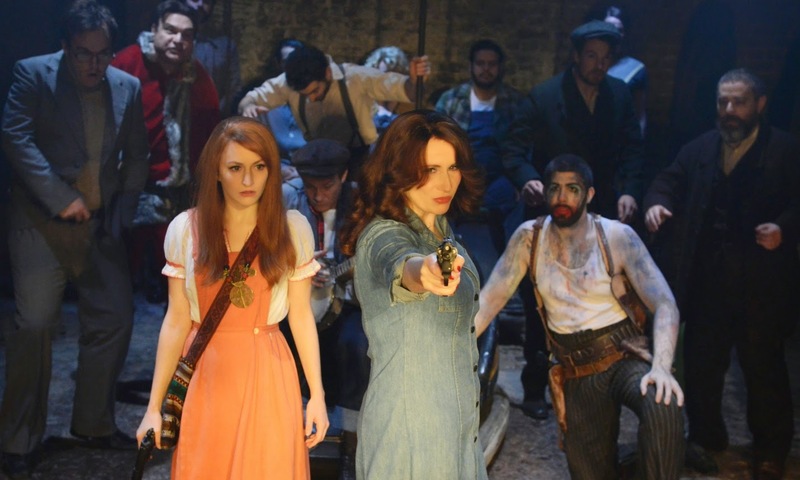 Watch: Assassins runs at the Menier Chocolate Factory until 7th March.